1995. Little did I know at the time the impact of what started this year would be. Personally I was more concerned with reaching double digits in age and getting my first Casio watch. It turns out that a few of what would become my top ten films came out this year. Die Hard, Usual Suspects and Heat. I’m not going to lie to you though, at the time I was far too interested in Toy Story! 1995 was also a big year for a certain Jean Paul Gaultier. Le Male, his first fragrance for men, was launched and went on to become one of the most successful fragrances for men of all time. Like the original Die Hard and Toy Story, it’s quite an act to follow. My current count is 18+ versions of Le Male in the last 17 years: Fleur du Male, Le Male Terrible, and the summer versions to mention a few. 2013 sees another iteration, but this time with a different angle. Le Beau Male still shares an herbal, lavender accord with the original Le Male, after this point though is where you easily start to notice the differences. Le Male was classically warm, musky yet sweet. 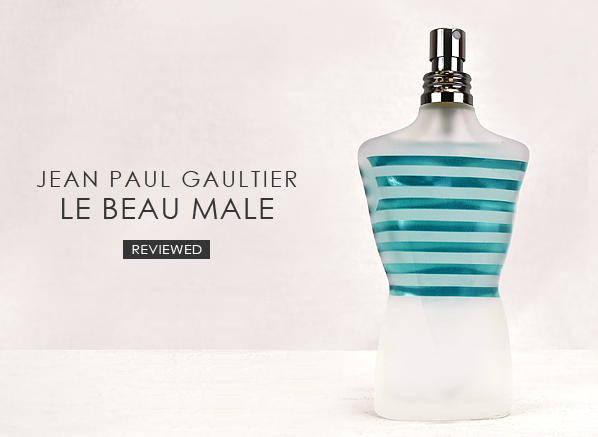 It’s no surprise that with its metal ice blue packaging, containing the ice cool white bottle with the familiar stripes, Le Beau Male is aiming for an icy freshness. Mint now takes centre stage. It’s there from the very start and carries the freshness all the way through. A hint of absinthe creeps in which I find lovely and in my view helps enhance the sage notes in the fragrance. Vanilla, which gave the original sweetness, is nowhere to be seen and the dry down reveals a cheeky hint of orange – although I didn’t detect it with every wear. ‘Intensely Fresh’ is the description on the metal outer packaging, and it definitely does what it says on the tin. I found Le Beau Male extremely wearable with an average longevity of 4-6 hours, although others found that it lasted longer. This entry was posted on Tuesday, February 19th, 2013 at 9:21 am and is filed under Guest bloggers, Men, Tried & Tested. You can follow any responses to this entry through the RSS 2.0 feed. You can skip to the end and leave a response. Pinging is currently not allowed. Actually when we bought this for him, we were shopping for me. But when i smelled that perfume i said that he had to buy this one 🙂 oh well this is such a lovely smell.